Girls are socialized that science and math are “too hard” or “a boy’s profession” and lose confidence in their math and science abilities. By their teenage years, a mere 14 percent of teenage girls want to become scientists, and are statistically less likely to pursue STEM (Science, Technology, Engineering, Math) majors. This spring, 75 bright young women from throughout southern Utah proved these statistics wrong. Accompanied by their families and educators, female high school students gathered in Southern Utah University’s Gilbert Great Hall to celebrate their academic and technological achievements at the second annual National Center for Women in Information Technology (NCWIT) Aspirations in Computing Award ceremony. 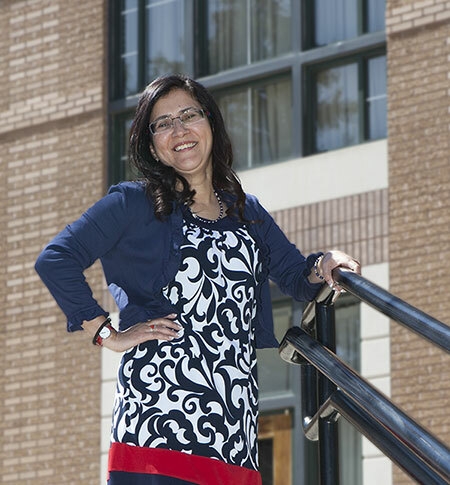 The mastermind behind this regional event: a five foot tall Southern Utah University Professor of Computer Science and Information Systems, Dr. Shalini Kesar. Don’t let her stature deceive you. Kesar is a strong, spunky woman on a mission to assist girls, especially in rural Utah, to pursue STEM degrees. When walking into an awards ceremony in a large banquet hall filled with 75 high school girls, you may not assume they are there to be recognized for their advancements in science, technology and computing, but on this day 25 women from southern Utah were chosen to receive awards and another ten were runners-up. The awards ceremony included a panel discussion and guest speakers who highlighted the opportunities for girls in STEM fields. SUU President Scott L Wyatt said to the girls, “When it comes to a choice, always take the harder path.” He encouraged the girls to pursue higher education with an emphasis in science and technology. In fact, according to a national statistic by the year 2020, there will be 1.4 million new STEM jobs in the United States and women will need to play a large role in meeting that demand. The personalized touch in Kesar’s outreach efforts has helped raise visibility for possibilities in science and technology among girls in rural southern Utah. Of the 10 high school graduates from the 2014 competition, eight are now continuing their education at SUU, a number she hopes will increase. Ellie Hoyt, a junior at Valley High School and regional NCWIT winner, said she was impressed with the ceremony and loved hearing about jobs available for women, specifically at Google. “What I took away from this is that I don’t need to feel intimidated when looking at the boy-to-girl ratio in my science classes, but to treat it more as an opportunity,” she said. When these 75 bright young women return to their hometown, however, they may not have access to the all technology they hope to play a part in creating. A recent report released by the Federal Communications Commission shows that nearly 39 percent of people living in rural areas of Utah do not have access to high speed internet. Kesar said she was shocked to learn that many of these girls didn’t have high speed internet at home or even a computer lab at their school. This only increased her motivated to make sure these girls have positive experiences with technology inside and outside the classroom. Courtney Friant, an Aspirations Award winner from Richfield High School, said she had a positive experience at the ceremony and hopes to continue her education in either engineering or education upon high school graduation. “I liked that they emphasized the opportunities available in engineering, instead of pointing out all the barriers that exist out there,” she said. This year, the number of girls who applied for the NCWIT Aspirations Award nearly doubled compared to 2014, and Kesar is proud of how far the program has come in just two short years. “The success of the program tells me there is a need to show high school students and administrators in these rural areas that opportunities like this exist,” she said. Southern Utah University (1897) located in Cedar City, Utah features more than 100 undergraduate and nine graduate programs across five academic colleges. The University's success is rooted in an unwavering dedication to students by tenure-track, full-time professors in small classes. SUU is host to the Utah Shakespeare Festival and the Utah Summer Games.